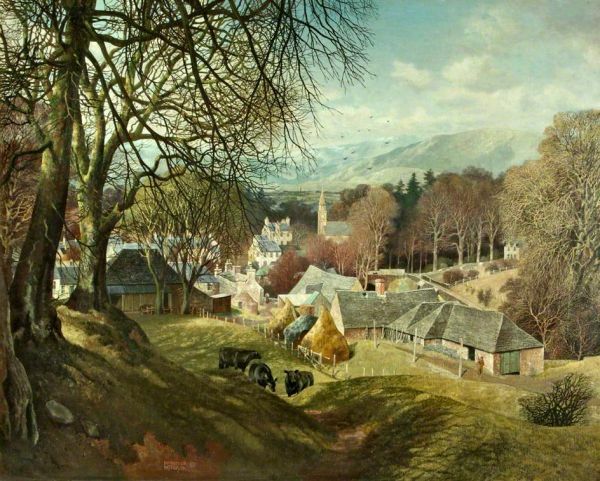 ( 1907-1998) A Scottish painter, noted or his finely observed paintings of the Angus landscape and Dundee, where he lived for most of his life. Unlike many other Roman Catholic churches which were destroyed during the Reformation, Stobo, near Glasgow, has retained much of the original 12th-century character, including windows, nave and chancel, The tower was raised above first-floor level in the 16th century, and further major restoration was carried out in the 19th and 20th centuries. 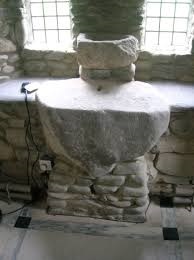 Legend has it that St Kentigern converted Myrddin Wyllt (Merlin Sylvestris) or Merlin (the wizard associated with King Arthur) to Christianity and baptized him. Merlin had fled to the forest after Gwenddoleuhad been defeated and killed at the battle of Arderydd near Arthuret in 573. 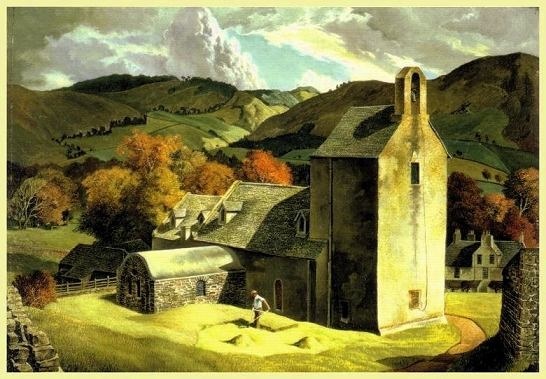 For many more paintings by the artist visit Art UK.